Long-time friends Tim Edmond and Dan Potter decided to leave the corporate world to pursue mutual interests in fermentation. 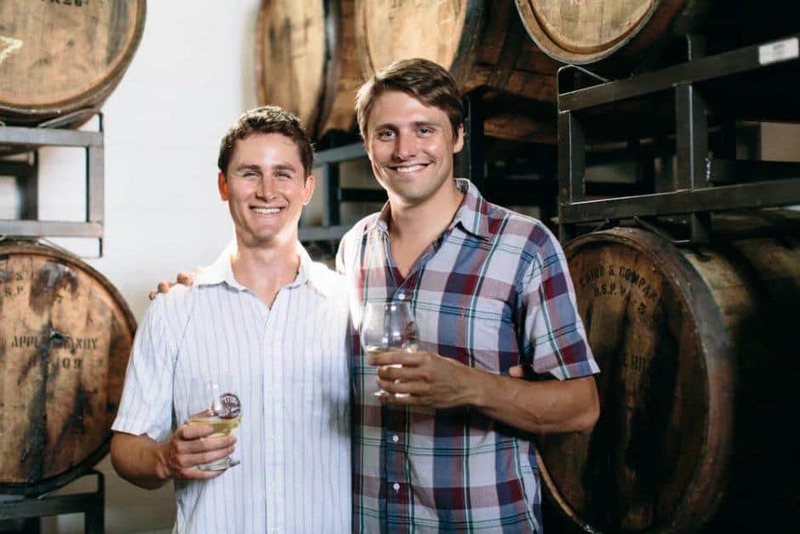 Their dream of starting a farmhouse brewery business using their own farmed ingredients was sidelined when the James River flooded an early planting of barley. However, another door opened when Dan set aside some sweet cider to ferment. Potter’s Cider has been a slow and steady process, settling into Free Union and Charlottesville and planting their first orchard a couple of years ago. Virginia is their home, and it’s the home of Potter’s craft ciders. Cider was “wide open,” said Tim. Cider has a lot of room for growth and experimentation. “Our goal is really to answer, ‘What is craft cider?’ by making intensely flavorful and aromatic ciders using local apples,” explained Tim. 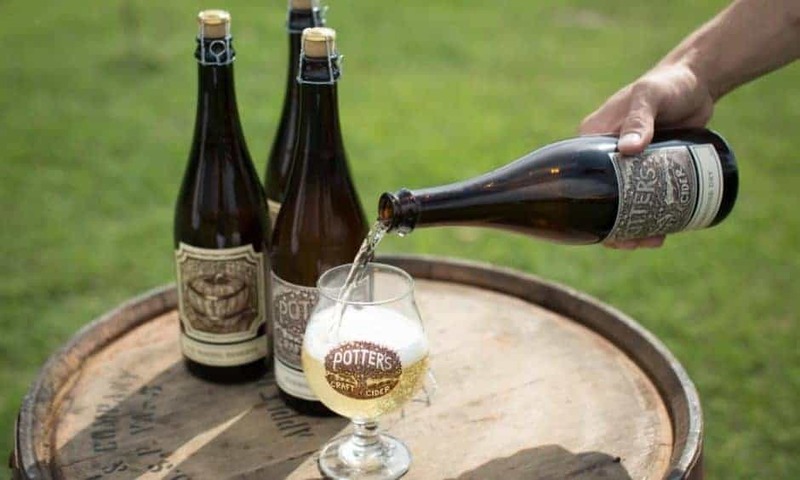 Potter’s ciders are “unapologetically dry and brimming with flavor and aromatic intensity,” said Tim, so they exist in a relative niche in the commercial cider market. Their apple selection, production methods and slow cold-fermentations are all designed to maximize the flavor and character of their ciders. Tim shared that as the cider industry grows and consumers become more aware of the spectrum of ciders on the market, their ciders definitely stand out and convey a real sense of the Central VA terroir. Tim and Dan have set up their home to make craft cider in the fabulous old Wildair Farm space. Beautiful and nestled right at the foothills of the Blue Ridge Mountains, they have incredible views, soil and climate for the cider they are crafting. The farm is situated in the town of Free Union, a quaint small town founded in 1761 and 10 miles north-northwest of Charlottesville. When they first started debuting their ciders, they were astounded that people took them seriously. They drove around town in Dan’s gold Crown Victoria in 2011; they were the first cidery in Virginia to offer cider on draft, and people loved the fresh, dry taste of Potter’s Ciders as opposed to the cloying sweet ciders made from apple juice concentrates. “After we got orders from Blue Mountain Brewery, The Local in downtown Belmont, Beer Run and Whole Foods, we said OK, maybe people will get this dry cider thing,” Tim shared. Tim and Dan’s process is to age ciders in barrels and work with a variety of barrels to get the most unique taste from their apples. “We have worked with Laird’s Apple Brandy Barrels, Copper Fox Rye Whisky Barrels, Rum Barrels from the Caribbean, neutral wine barrels and we have a load coming soon from VDC’s, which aged their single malt. 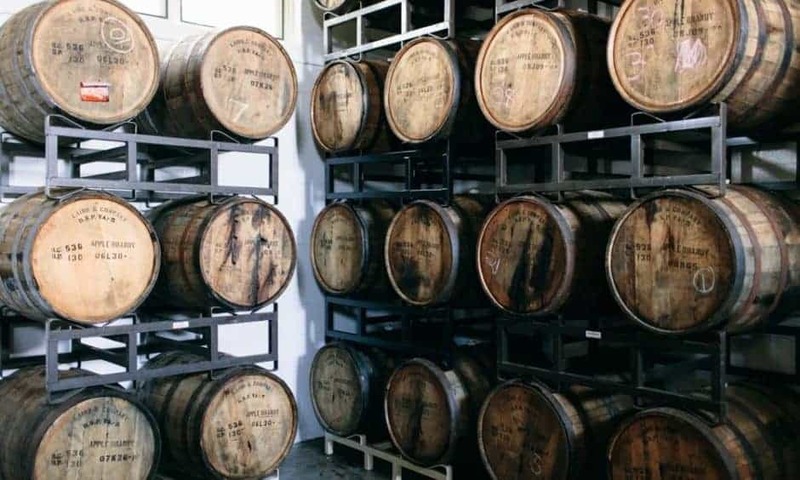 We like to participate in barrel exchange programs with the local distilleries—we use a barrel, give it to the distillery to age spirits again and receive it back from the distillery for more cider and so on,” he described. The ciders they are currently offering are Farmhouse Dry, Raspberry and Brett (a sour cider with fresh local raspberries aged in apple brandy barrels), Mosaic Hop Cider, Citra/Amarillo Hop Cider, Grapefruit Hibiscus, O’Tannenbaum (spruce tips and juniper berries) and Oak Barrel Reserve (aged in apple brandy barrels).